There have been several reports over the past few months where foreigners were fined by immigration for not staying at their registered address in Thailand, e.g. here and here. 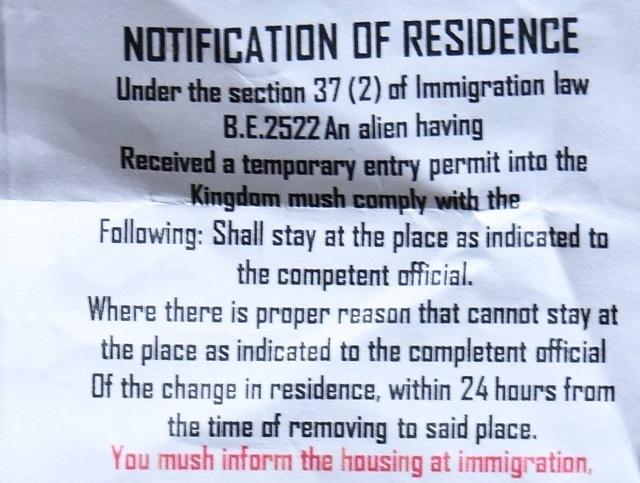 Likewise, guesthouse and condo owners have been fined for failing to register their guests with the local immigration office within 24 hours of arrival as is apparently required by law. Thai immigration police want to know where all the tourists and expats are staying, and if a foreigner moves from one place to another he/she, or the new landlord respectively, will have to notify immigration of these movements within 24 hours of the foreigner’s arrival at the new place. Likewise, if you extend your visa you will now have to provide some proof of address; otherwise your application may get rejected. Also, when you apply for a new visa many embassies and consulates will now require the applicant to indicate an actual street address in Thailand where he/she plans to stay. An address must also be clearly indicated on the arrival/departure form you have to fill when entering the country. While this is actually all nothing new, in the past no one would ever get fined for staying at the “wrong place” so-to-say. This appears to have changed since the 2015 bomb attacks in Bangkok and increasingly so in recent months. So what does this mean in practice? If you visit Thailand for just a couple of weeks and stay in a hotel there’s probably nothing to care about. The hotel where you’re staying should register you with immigration and you will likely never have to visit immigration yourself. It’s getting a bit more complicated when you stay in Thailand a bit longer and will eventually have to extend your visa, especially if you travel a lot during your visit to Thailand, stay in a smaller guesthouse, rent a condo or live with a friend or your girlfriend. Many small guesthouse and condo owners will actually not register their tenants with immigration and you would technically have to do that yourself in person. You can find more information on the documents that are required to do so on this page. Now we don’t expect immigration to actually check on every foreigner in the country, but there may obviously be random checks, especially at small guesthouses and condominiums. So if you’re not sure whether or not your landlord has registered you with immigration you better ask him and may want to do that yourself. Likewise, if you own a condo in Thailand and frequently rent it out to foreign guests be aware that you have to register your tenants with the local immigration office within 24 hours of their arrival. Granted, that’s a pain in the rear, but it may be better to be safe than sorry and eventually having to pay a hefty fine.